My first job was working second shift, for Met Life, 15:05 to 22:50 (3:05 pm to 10:50 pm), the Met Life buildings were huge buildings on 23rd and Madison Ave in The City. They had a newer building and two older buildings including the Met Life Clock Tower. Met Life is no longer in those buildings. They moved to the old PAM AM building in mid town and to a building in Long Island City in Queens. My first computer system was the Honeywell 200 printing subsystem. 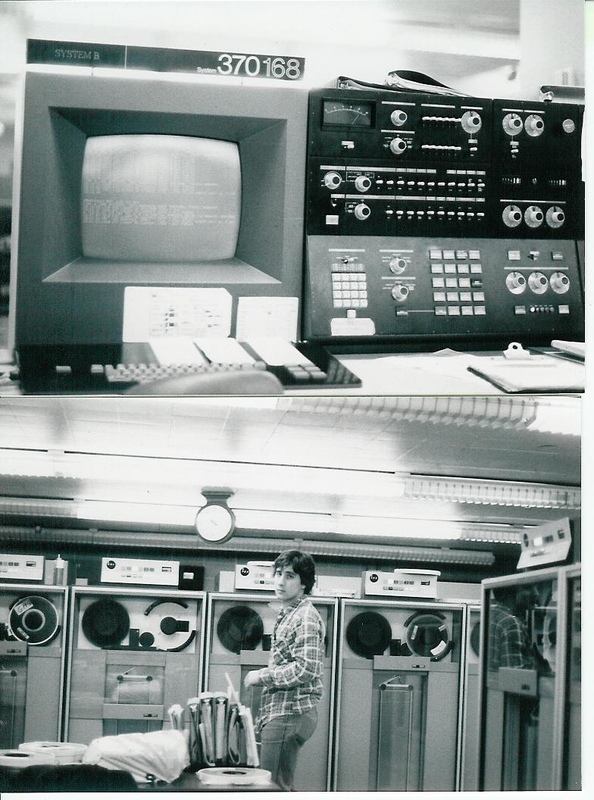 The system consisted of several drives, an operators console and three high speed impact printers. Once a tape was mounted, you had to initialize the printer, then check the header info, make sure the paper was positioned properly (more important when printing forms) then send another command to the printer to start printing. These printers were metal hammers hitting a metal cylinder that had all the characters on it. With three printers going all at once, the noise was extremely loud. We had it measured at 120 decibels. The Honeywell 1800 Tape System would create tapes and we'd get them to print. These were forms to go out to Met policy holders, internal 1-ply insurance statistics and stuff like that. These were 3/4" metal tapes that had to be cycled up manually on the tape drives. My right arm was getting a workout. The read/write rings for these tapes were small metal rings that popped into the center of the tape and were hard to remove when the tapes needed to be write protected. Our instrument of the day was the Flair pen. All tapes, once written, had to be initialed and dated (something I still do today when creating CDs). We rubber banded a paper clip to the bottom of the pen and used that as a pry tool when we needed to pull the read/write rings. Worked very well. 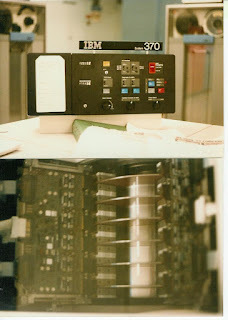 By the time I was ready to move up to the Honeywell mainframe, the tapes became 1/2" plastic. The rings were of course plastic as well and provided hours of frisbee like fun throwing the rings around the computer room. 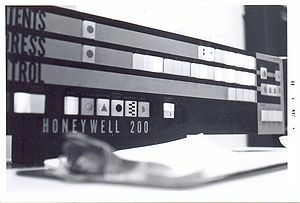 The new Honeywell 8200 mainframe consisted of four banks of eight tape drives, a CPU complex and a print system console and keyboard. Jobs were loaded via a card reader. There were no disk drives at this time. 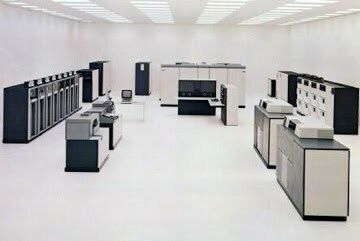 The Honeywell systems finally went by the wayside and I was introduced to my first IBM system. I'm not counting the 360/20 I worked on for a few days. 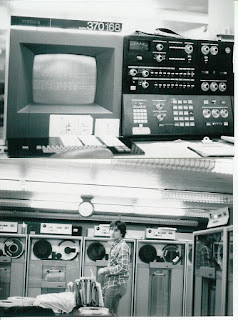 It was the IBM 370/168 running VM. 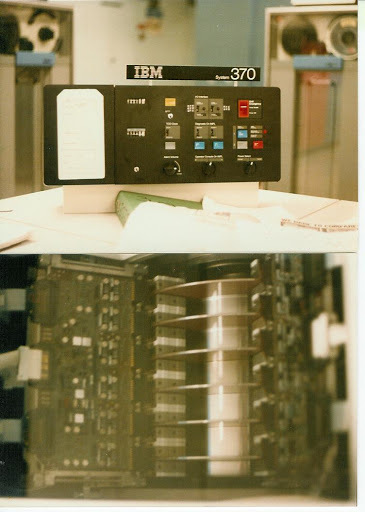 The 168 had a massive 12meg of memory, six belonged to IBM and six belong to National SemiConductor. It had a hardwired system display console and banks of 3330 disks drives. These were the ones with the movable hubs and moveable platters that resembled cake tins. If you had a string of drives 100-107 and you wanted the first physical drive to be 105 instead of 100 you just moved the hub. Very slick indeed. Of course these drives had those removable "cake platters" dasd you could mount and unmount as needed. Softwarily, you would VARY these online/offline as needed. It also had a 2305 paging unit which was a fixed disk just for paging. It also had a 3705 Communications box which had to be one of the best boxes IBM made, you couldn't bring it down with a stick. But when it did go down, it could stay down a long time. I enjoyed that hardware and the things you could do with it. On one smaller comm device, a 2701, it handled only one 56kb port. Sometimes it would get hung up and not connect to the remote side. You actually had to take the cover off, locate two particular pins on a circuit board and using a paper clip jump them together, this would force the connection. Truly amazing. The 168 took up a large portion of the computer room, the consoles, memory, PCDUs, dasd, Leibert coolers. After becoming lead operator I was promoted to a Technical Supporrt person. We were called when the system abended, we determined if the VM system programmers needed to be called or IBM. We worked with all the support people that handled the data center. We installed modems, comm patch panels, comm testing gear and coordinated all aspects of the data center. I became Change Manager and was responsible for all software, hardware and environmental changes to the data center. That was a fun job, but it required me to be onsite every Sunday. So I worked six days a week for a very long time. As Change Manager I would hold weekly meetings with the people responsible for the changes being planned for the weekend. You haven't lived until you've spent a few hours pouring distilled water into an IBM PCDU (Power/Coolant Distribution Unit) at three in the morning on a Sunday night for an IBM 3033 Mainframe. Sometimes because space was a premium, we had to have maps of how a new head of string or dasd was going to be moved through the data center. The floor plan of the Data Center was resembling a Rubiks Cube. So in our weekly meetings along with the changes, and backout procedures, I also had a map showing how a particular piece of equipment would navigate through the data center. Down this aisle, make a right at the 3705, swing the 3350 dasd out 90 degrees, etc. Loads of fun. We also had to contend with a data center floor less than a foot deep. The floor was filled with bus and tag cables (gray away!) that floor tiles would ‘float’. It was a wonder how these system got cooled at all. They changed my title to Network Analyst but I did the same job. It was time for a change. My wife and I had enough of NYC and moved to Florida. I did spend a few months at the Metropolitan Transportation Authority in NYC as a Change Manager there but left quickly when the FL job opened up. The MTA job was cool, I got free rides on the buses and subways and the office was located at Columbus Circle in the City. So I bought a used Honda and rode to work every day on a bike and parked it right outside the office in a motorcycle parking area. But when the opportunity to move to FL came up we couldn’t resist. 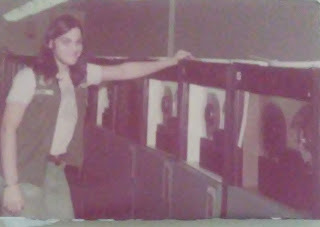 I worked as a VM Lead in Customer Service for Martin Marietta Information Systems then got promoted to work in the PC Support area. When I first got started in PCs we had one PC/XT with a dial out program. Our task was to test things out and work with Martin users who were getting PCs. When I became PC Support Manager for Customer Service I had six people working for me. In one year, that dwindled down to me and another guy. Then only me. I became involved with the dial up community and became the local expert of dialing up the mainframe with 3270 emulation. Our first attempt at a dialup program was something called MailIT. MailIT was OK but the dialup scripts were written in assembler and compiled so that any timing parameters could not be adjusted. We corrected that problem and I created a series of logon scripts depending on how a user came into the system. They could either use the Simware host 3270 emulator or the Renex Protocol convertors. The scripts were logically laid out and provided a method to adjust the "waitfors" if needed. When we made the switch from MailIT, to Simware's SimPC, instead of writing single scripts to support logons to VM's PROFS mail system, I wrote an application that would allow that. This would be my only coding effort and it turned out quite nice for that time. I called it LogonSYS and using a stripped down set of SimPC executables and my code, it was able to dial up from home, work and hotels using 1200, 2400 or 9600 baud modems as well as an Irma connection if you were locally connected to a 3274 controller. I added some bells and whistles such as dialing an 800 number to Compuserve and get their access numbers, a search program written in Turbo Pascal to display access numbers in any state of the US, a print program to print PROFS notes and documents to a local PC printer and file transfer capabilities using IBM "IND$file" on the host. I created error routines that would be saved to a file that showed where in the logon process it was failing. Since I was basically sole support for this, this became very useful. What was really good about the whole thing was, I cut the diskettes, produced the labels and the manual and sent the users the software. I had complete control. 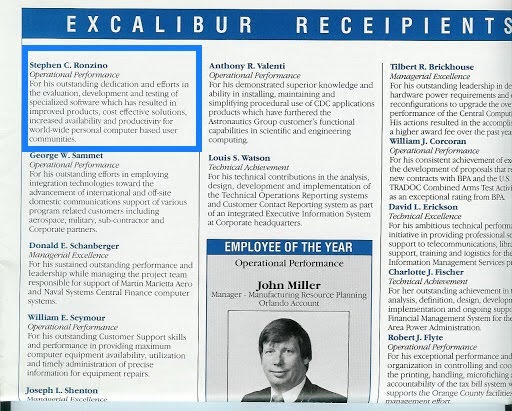 This effort got me the Martin Marietta Excalibur award, also called the glass shaft. They flew my wife and I out to Denver for an awards dinner even provided a stipend for my wife to buy a dress. Another part of my job at Martin was to administer the X400 PC gateway. This was our X400 connection from PROFS to the rest of the X400 community. The gateway we used was provided by SoftSwitch out of Wayne, PA. This was my first introduction to the UNIX OS. 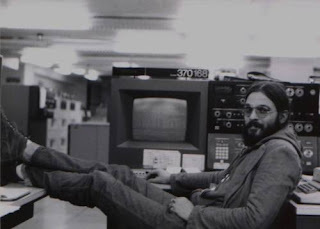 It was called Interactive UNIX and it ran on an Intel machine. I took a few classes on UNIX at Martin and that really lead me to get ting hired at SoftSwitch. Getting hired at SSW was the easy part now I had to figure out how to sell the house and move the family to Wayne, PA. I got an apartment in Phoenixville, PA just on the other side of Valley Forge and started in July of 1993. Moving to PA and leaving the family in FL was not the best solution but I saw moving to SSW as an opportunity that was too good to pass up. I started as an X400 support person, dialing into customers X400 PC gateways and troubleshooting their boxes. I did this for only three months and was moved over to EMX support. EMX was SSW's offering in email exchange. It was a DG Unix system that would allow disparate email systems to talk to one another. Although the idea was great, the product was hard to install and the software was susceptible to crashes. Customers had to purchase our offering which included the DG hardware and UNIX software and the EMX application. A SSW installer would then go onsite and install the box. So I supported that box for about nine months and decided I didn't want to answer the phones anymore, been there done that. So I told SSW I was going home. Ironically, the day I decided to go home was the day someone finally put an offer in to buy my home in FL. Oh well. SSW made me an offer to stay with SSW and become an installer. This way I can move back to FL and go on the road and install SSW products. I was thrilled SSW wanted to keep me. When I left Martin Marietta after eight years, no one asked me anything about staying on. 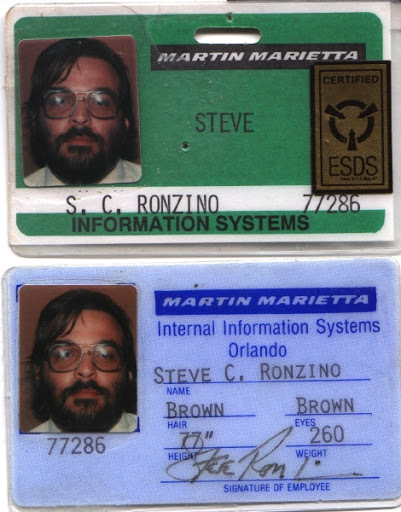 So in July 1994 I moved back to FL and became an installer for SSW. There was alot of travel but with the travel came the rewards. I went to London in both the UK and Canada. I went to Singapore and Maylasia, Germany, Spain and all over the US and Canada. I was able to build up enough points to fly first class on all my vacations and stay at Marriott's for a week at a time for free. In the mid 90s, Lotus bought SSW, then IBM bought Lotus. Things were going to change. SSW made the move off of the DG platform to AIX on RS6000. We brought in some AIX developers and re-wrote the install process and the product became stable. We were able to go onsite and load EMX now called LMS, Lotus Messaging Switch in record time and get mail moving. 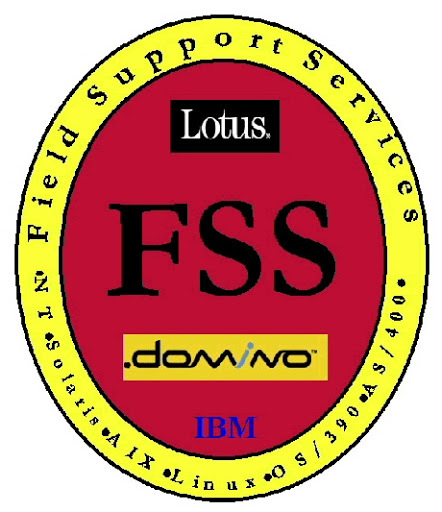 I did that through 1999 and in 2000 became part of the IBM Field Support Services for Lotus Software. The LMS product was slowly becoming obsolete. Companies were deciding to go with either Exchange or Notes so the need for an email protocol conversion appliance was quickly going by the wayside. 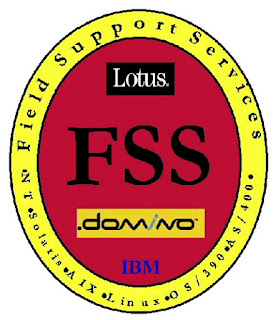 As an FSS (Field Support Services guy) my primary job was to provide Emergency Onsite Support (EOS) for Lotus Domino customers. This usually required very little advanced warning and was dispatched to the customer within 24 hours of when the issue was reported to Lotus. The old SSW group merged successfully into the Lotus FSS group and we began doing FSS work in the form of assessments, migrations and educational days. But the constant traveling was beginning to take its toll. 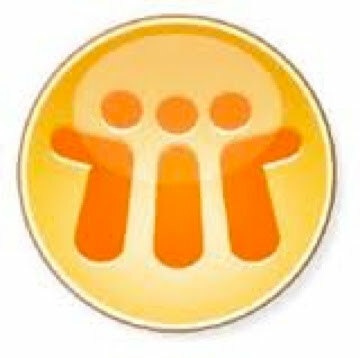 Lotus was bought by IBM but still retained its independence from the IBM world. Either way, traveling every week was getting old. I made inquiries within IBM to try and get out from the heavy travel but IBM didn’t seem to care. By the time June of 2005 rolled around, I was unceremoniously RIF’d. Laid off. Took it quite hard as I had never lost a job in my whole IT career. Wasn’t quite sure what was gonna happen. I wasn't getting any younger and still had a family to provide for. So I hit all my previous work connections, sent resumes to every job board, and IT company I could think of. I did that for six months. Then got a call from an IBM Business Partner, called Agilysys. Never heard of them but they were looking for an IBM pSeries guy for FL and the SouthEast. I’ve been in support almost all of my career. This would be my first job in sales, specifically pre-sales. So I was understandably apprehensive going in. I had a couple of phone interviews, met with one of the guys here in FL and flew up to NYC to meet the Director and some of the team at our BPIC (Business Partner Innovation Center). As I approach the last pages of my life I’m taking a closer look at how I want that life to be. I’ve spent most of my life working in IT which has always been my lifelong dream. In my sixth grade autograph book, I wrote my profession to be as computer programmer. I had no idea what that was at that time but it had something to do with computers and that’s all I wanted to do. So after almost 50 years in the IT business I am now retired. So how many years are left? 15, hopefully 20. Considering how fast the last 20 years flew by, its not a lot of time. My world view has gotten more focused. After spending some time raising, chickens, ducks and turkeys I’m not all that thrilled in how we mass produce meat for consumption. The factory process of herding thousands of live animals to their slaughter, in unimaginable conditions is barbaric. So I’m taking small steps to remove meat from my diet. It will be hard but I’m willing to give it a shot. Living in Brooklyn in the fifties was a short stay for me. I lived on Stagg Street, in the Williamsburg section from when I was born in 1953 to 1957. We lived over a grocery store in a railroad flat apartment. Spent a lot of time outside on the street playing while my mother hung out the window to keep an eye on me. After all I was just three or four. Yeah, you could do that back then. My Mom’s friends, Frenchy and Martha, lived down the street. We would visit them a lot over the years. As they sat around and drank coffee and talked, I was downstairs on the stoop hanging out with Dirty Joanie. After we moved to Middle Village, we came back to Brooklyn a lot to visit, go shopping on Moore Street, go to the dentist and visit my grandmother who lived on Grand Street. On Grand Street was the fish store and they had the best French Fries. We would get a dollars worth in a brown paper bag.